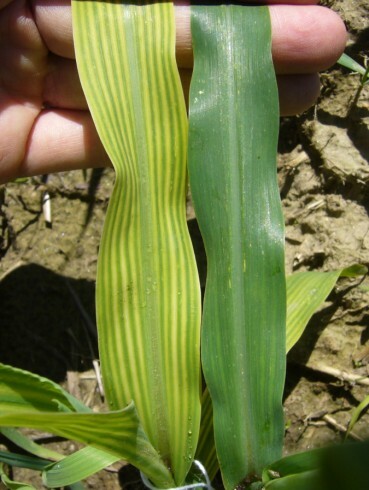 The maize seedling (Zea mays) on left has a yellow stripe mutation that inhibits iron accumulation from the soil. With limited iron concentrations in the plant, chlorosis develops between leaf veins and distinct yellow stripes appear along the length of the leaf. A wild type maize seedling is shown on the right. Photographed in daylight with a Panasonic DMC-FX8.